Air masses are important features of the atmosphere that have a strong influence on weather patterns. An air mass is a volume of air with a large horizontal spread -- typically in the range of 1,600 kilometers (1,000 miles) or more -- that originates in a particular geographic region with uniform temperatures. Air masses that originate near the equator are typically warm and moisture-laden, and they feed tropical rain forests and fuel hurricanes. Meteorologists classify air masses according to the latitude at which they develop and whether they develop over land or over the ocean. Arctic and Antarctic air masses develop at the highest latitudes, polar air masses at slightly lower ones, followed by tropical ones and finally equatorial ones. Those that develop over water are maritime masses, while those that develop over land are continental. Continental masses are typically dry, while maritime ones are moist. Only six air masses exist because Arctic air is seldom moist, and equatorial air is seldom dry. Equatorial air masses develop at latitudes from 25 degrees north to 10 degrees south. Temperatures are high, and because there isn't much land at those latitudes, equatorial air masses are all maritime. They are laden with moisture because water readily evaporates into the hot air at the equator. Warm air has a tendency to rise, and the trade winds that prevail near the equator push it into the cooler upper atmosphere, where the moisture condenses into ice crystals and turns into rain as it falls to the ground. 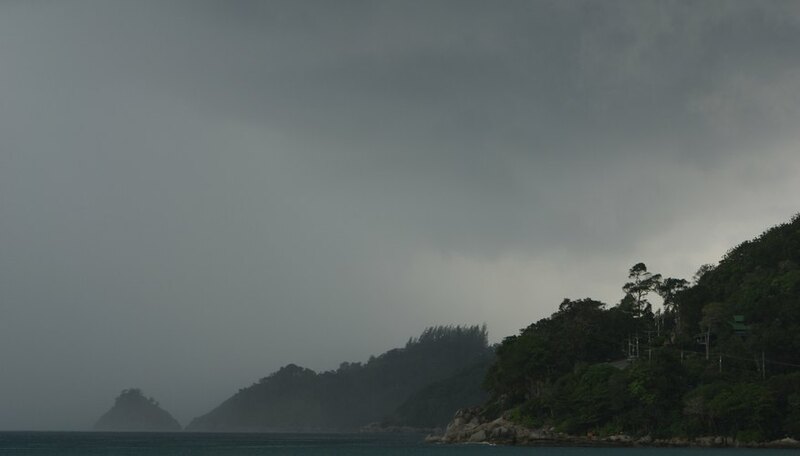 Consequently, thunderstorms are frequent in regions dominated by equatorial air masses. The air at the equator is the hottest on Earth, and its tendency to rise into the upper atmosphere creates areas of low pressure. As a result, cooler air rushes in from higher latitudes to fill the semivacuum, creating strong and consistent winds. These winds tend to die out near near degrees latitude to become weak and variable. The winds push the warm air high into the atmosphere, where temperatures are cool and towering clouds are typical. The frequent rainstorms feed the equatorial rainforests of the Amazon and Congo basins as well as those of the East Indies. Hot temperatures at the equator can drive saturated water into the upper atmosphere at an accelerated rate, creating strong winds as cooler air rushes in to replace it. If this occurs far enough from the equator, the Coriolis force caused by the Earth's rotation deflects the winds, and they can begin to spiral around an central point of low pressure, called the eye. When the wind speeds reach 62 kilometers per hour (39 miles per hour), a tropical storm is born, and if the wind speed increases to 119 kilometers per hour (74 miles per hour), it becomes a hurricane or tropical cyclone. NASA: How Do Hurricanes Form? Deziel, Chris. "Equatorial Air Mass Characteristics." Sciencing, https://sciencing.com/equatorial-air-mass-characteristics-17044.html. 25 April 2017. How Does Elevation Affect Weather?